Morning all ..& Happy Easter... and hope everyone remembered to put their clocks forward...a few less ZZZZZZZZZZZs but can always have a catnap later. 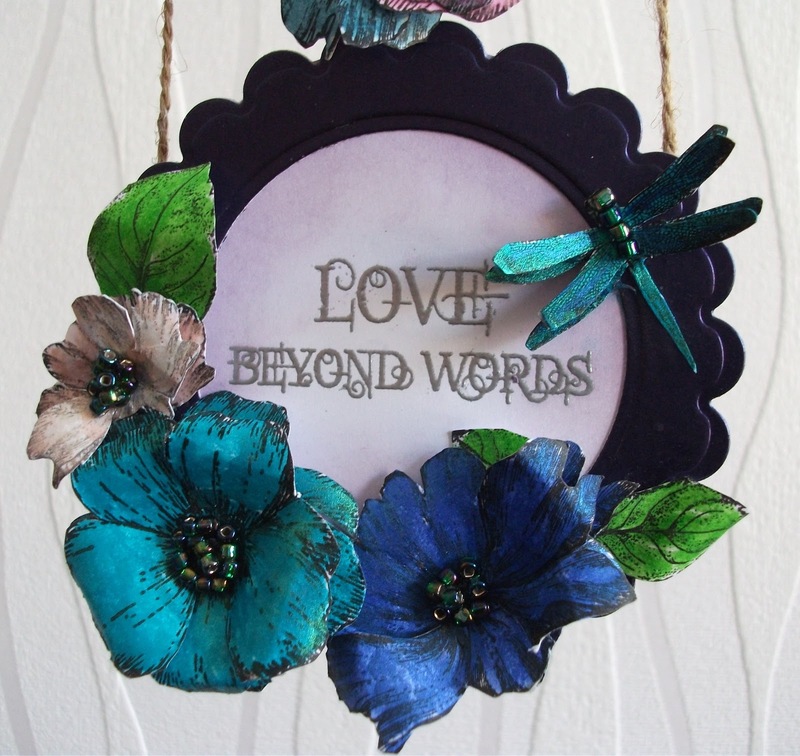 On the 21st March new Indigoblu Challenge was announced...Words & Phrases loved this theme but needed to think about it, anyway had a play yesterday and this is what I ended up with. It was all made using Indigoblu's Live Laugh, Love stamps. Flowers, birds and dragonflies were all coloured in with Cosmic Shimmer Acrylic drawing inks which give a lovely iridescence. 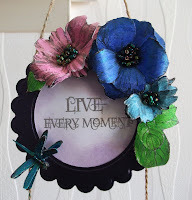 Having cut them out and shaping with an embossing tool I layered them up to give some dimension. I finished each flower off by adding a blob of Cosmic shimmer glue to the centre (it dries clear) and sprinkling some seed beads I had in my crafty stash. 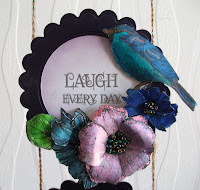 The words were stamped & embossed in silver and then cut out with a circle die and the frame was made with a scalloped circle & plain circle die. These finished framed pieces were then mounted onto this .... which cost me £1.99 ...it was an impulse buy which I saw hanging on a shelfedge in my local craft shop, I didn't know what I was going to do with it but when I was mulling over what to make for this challenge I saw it hanging from the doorknob and had a Eureka moment. I just gave it a coat of gesso & acrylic paint to finish it off. This last pic shows the dimension I got by using embossing tool and layering up. Indigoblu stamps are so easy to use ... the impression you get is great even the first time you use the stamp. Well I'm off now to link this up with Indigoblu challenge. When I was making this I had someone in mind who just happened to mention this was one of her favourite quotes so hope she likes it!! This is absolutely beautiful Annie. I love wall hangings and this one is just stunning. Great colour combination and I love your attention to detail. Gorgeous Wall Hanging. The colour combination is pretty and I love the text on each part. The arrangement of the flowers is really nice and the detail is really good. Fabulous wallhanging, love the wonderful flowers, colours and wording. Thank you for visiting my blog and leaving your lovely comment.